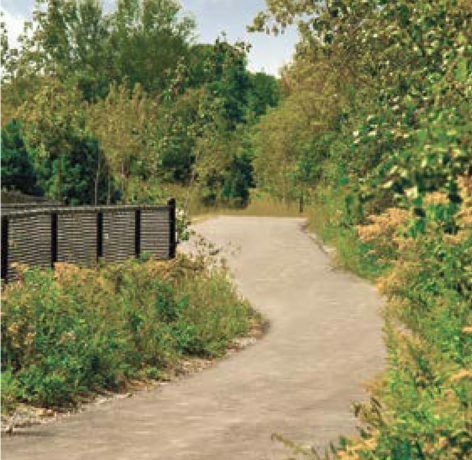 Homes at Trails will reflect Cardinal Point’s highly desirable “Urban Heritage” exteriors. Geranium Homes has earned its reputation for being a new homebuilder that creates original home designs which emphasize liveability. 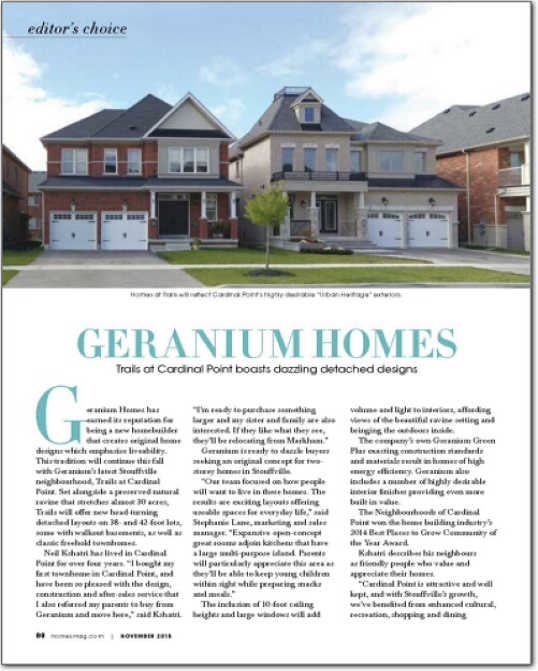 This tradition will continue this fall with Geranium’s latest Stouffville neighbourhood, Trails at Cardinal Point. 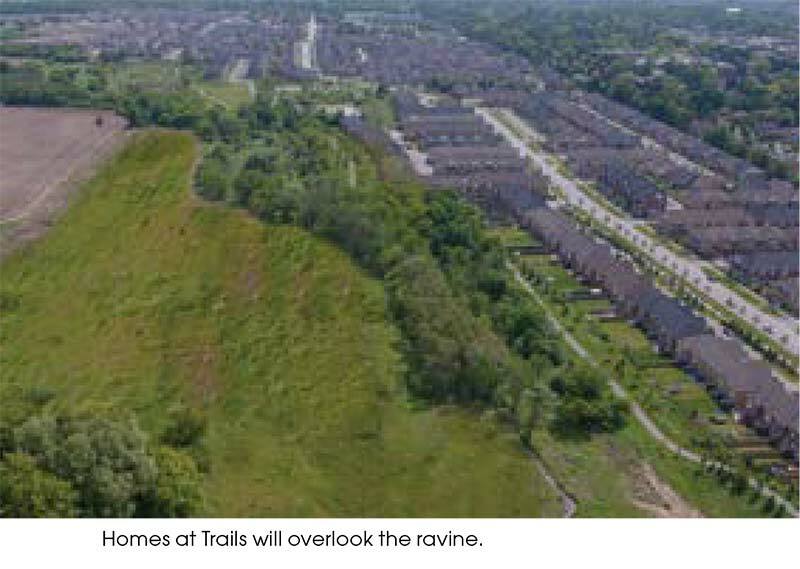 Set alongside a preserved natural ravine that stretches almost 30 acres, Trails will offer new head-turning detached layouts on 38- and 42-foot lots, some with walkout basements, as well as classic freehold townhomes. Neil Kshatri has lived in Cardinal Point for over four years. “I bought my first townhome in Cardinal Point, and have been so pleased with the design, construction and after-sales service that I also referred my parents to buy from Geranium and move here,” said Kshatri. Geranium is ready to dazzle buyers seeking an original concept for two-storey homes in Stouffville. The inclusion of 10-foot ceiling heights and large windows will add volume and light to interiors, affording views of the beautiful ravine setting and bringing the outdoors inside. The company’s own Geranium Green Plus exacting construction standards and materials result in homes of high energy efficiency. Geranium also includes a number of highly desirable interior finishes providing even more built-in value. The Neighbourhoods of Cardinal Point won the home building industry’s 2014 Best Places to Grow Community of the Year Award. Kshatri describes his neighbours as friendly people who value and appreciate their homes. with Stouffville’s growth, we’ve benefited from enhanced cultural, recreation, shopping and dining options,” he said. A few minutes’ walk from Trails is a large park, which is a popular gathering place for residents. 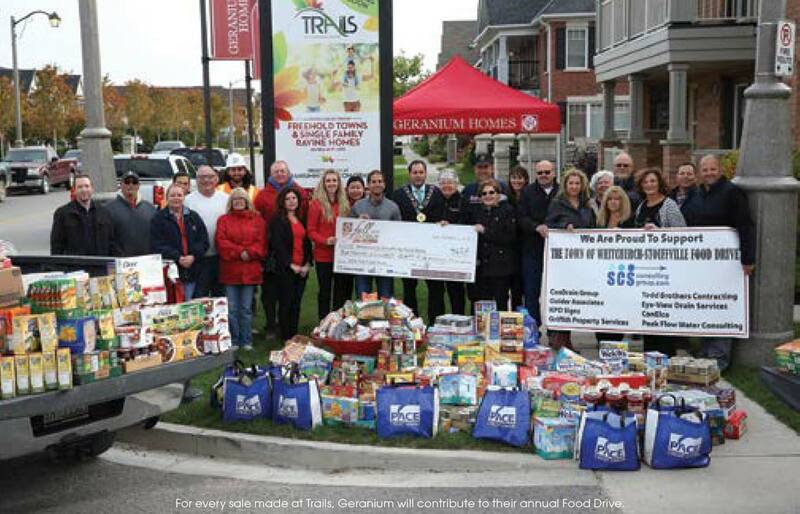 Geranium holds an annual Community Barbecue in the park that includes a Fall Food Drive supporting the Whitchurch-Stouffville Food Bank. “Over seven years we’ve raised almost $46,000 on top of food donations,” said Lane. Cardinal Point is close to Stouffville’s vibrant Main Street with GO Transit Train services and many annual events. Nearby are golf courses, Highways 404 and 407, and Markham Stouffville Hospital. Register now to be among the first to view Geranium Homes’ final release of single-detached homes in Trails at Cardinal Point. updates and details on the preview sales event.